Dr. Bean received a B.S. in Biology from Creighton University in 1972. 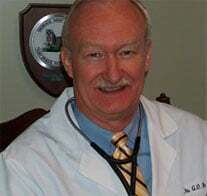 In 1976, he graduated from Bowman Gray School of Medicine. Dr. Bean completed his residency through the US Army, at Womack Army Hospital. He has been Board Certified in Family Practice since 1979. Dr. Bean has been the President of the North Carolina Academy of Family Physicians and Vice President of The North Carolina Medical Society. It is a real treat for him to see three generations of a family in the same exam room at the same time. Dr. Bean enjoys snow skiing, traveling and spending time with his family.